Dodd Narrows near Nanaimo, BC has one of the best high current dives on Vancouver Island. If you like extreme diving with awesome rewards this dive is for you! This is an advanced level dive due to the potential for extreme currents and boat traffic in this tight little water way, and can only be accessed as a boat dive. To do this dive it is strongly recommended that you follow an up to date, Canadian Tide and Current Tables, volume 5, Juan de Fuca Straight and Straight of Georgia. Follow the above link, select the correct year, select Current Tables, select Volume 5, select Dodd Narrows, then choose your day/s and time/s to dive here accordingly. The amount of marine life and colour on this dive is absolutely amazing, and will leave you wanting for more. It is a dive where you just can't get enough, and every time you look in a new direction, there are more interesting things to see. 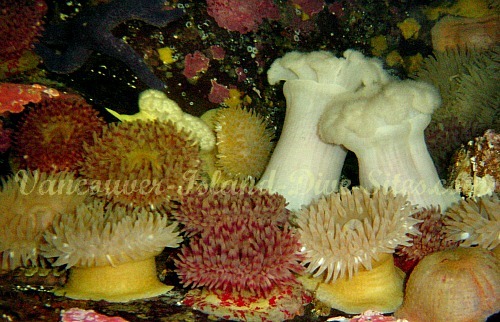 This absolutely incredible dive site is located in south Nanaimo near an area called Cedar. Dodd Narrows runs between Cedar and Mudge Island, which is not very wide or deep (about 70ft (21m) or so). Consequently, this is a high current water way, which often runs between 5 and 9 knots. You will most likely do a live boat drop to do this dive, in which case the dive is fairly straight forward, but it is possible to use an alternate method which is very, very cool. With a smaller boat you can anchor in a little bay located at the south entrance of the narrows, on the cedar side. On certain days and times, (available in the above mentioned guide) you can then gauge your entry, so that you can ride the current through the narrows, and then when the current changes direction it will bring you back to the starting point. Pretty awesome way to do this dive! You can use this method from the opposite end of the narrows as well. Just stay on the same side, as there is an anchorage there as well. We have done this drift dive using the above method, and it's a good one. Either way find time to dive the narrows if you are visiting Vancouver Island, you will be more than satisfied, guaranteed.